“Ron de cortesía” is probably the nicest welcome I’ve encountered checking into a hotel. The decanter of courtesy rum was just to the right of the tiny reception in Las Clementinas, a beautiful apart-hotel in Panama City’s Casco Viejo (Old Quarter). Far more grown-up than a hot towel and a fruit juice, a quality rum slows you down, gets your pulse running at the right beat for the tropics, and casts you back to a time when straw hats and molasses were the exports of Central America’s only real city – rather than dubious financial instruments. But Panama City’s fortunes have always swung high and low. Founded in 1519, it’s the oldest European settlement on the Pacific coast, celebrating its 500th birthday next year. The transit port for Spanish silver, it was ransacked by Henry Morgan in 1671. Then came the great project of a trans-isthmian canal, and a French engineer to botch it. Hollywood-style, the Americans stepped in, finished the job, and insisted on running – nay, owning – it for almost a century. In 1964, 22 Panamanians were killed by the US Army during protests over sovereignty of the Canal Zone. In 1999, when the gringos gave it back, Panama City began its latest reinvention. 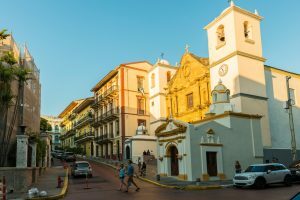 At tropical pace, it’s taken time to take off, but at last the Casco Viejo is dotted with cranes and construction sites. The 1908 National Theatre is being restored. Civic palaces and old hotels are being rendered anew. Everything is getting a pastel-hued paint job. A high standard was set four years ago when the American Trade Hotel reopened on Plaza Herrera. The 1917 former apartment block turned department store, was rebuilt by the trendy Atelier Ace group and Los Angeles design firm Commune; now one of the most elegant properties in Latin America, it’s all custom-made French and Mexican furnishings, geometric tiled floors, potted plants and bold black and white decor – a nod to the famous hat. The waterfront is being overhauled. 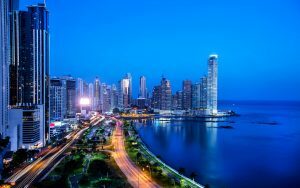 Panama City is a peninsula and you can stroll around the perimeter in an hour – allowing for stops. Only the north-east corner, site of the Palace of Herons – the Panamanian president’s official residence – is cordoned off. I dawdled longest at two plazas – one dedicated to the French connections, another to Holy Roman Emperor Charles V, who first mooted the idea of a canal back in 1534. Step away from the shore and into the grid city and you’re plunged into a thriving museum of colonial heritage. Every other building seems to be a smart boutique or trendy restaurant. Fulfilling a long-repressed fashion fantasy, I bought an Alberto Pons guayabera – a four-pocketed linen shirt – from an airy shop called No Me Olvides (Don’t Forget Me). Some refurbs are taking time. Only the facade remained of a Jesuit church, its windows full of sky. Scaffolding had cut off entire blocks, with huge props supporting fragile brick-and-adobe walls. 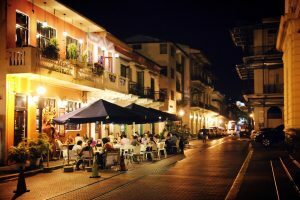 Much of the city recalled Cartagena in Colombia, though the Casa Góngora, built in 1760, could easily be in New Orleans’ French Quarter; the Unesco World Heritage listing for Panama City highlights its “unusual mixture of Spanish, French and American styles”. There’s plenty of mixing down at The Strangers Club, a speakeasy-style joint opened by six New York bartenders – four of whom run the West Village Employees Only bar – who hooked up with local rum distiller Carlos Esquivel. Bartender Kevin made me a sultry cocktail with mulled wine, whisky and ginger. Originally from El Salvador, he landed the job by emailing, cold, one of the owners. That kind of approach works in Panama City – I guess the Strangers Club had to live up to its name. In Spanish, the word for strangers, “extranjeros”, also means “foreigners”. Panama City is a cosmopolitan place. Over five days, I met American hoteliers, Venezuelan guides, Argentine grill chefs, French waiters, Colombian baristas. They served German beer, Thai curry, moules et frites, tacos, burgers and Panama’s very own much-mythologised Geisha coffee. It reminded me of a great song, Plástico, by Panama’s finest singer-songwriter Rubén Blades, in which he summons the “Latina conscience”, naming all the nations of Hispanic America. Each one responds, “Presente” – or “Here, sir” – in school-register fashion. In 1826, liberator Simón Bolívar organised a meeting in Panama to promote the unification of Colombia, Mexico and Central America. The first such attempt to unite a people, it failed, as have subsequent efforts. But Panama is the ultimate melting pot and one of few places where Venezuelan exiles have been made welcome and found employment. North of the Casco Viejo are two other incarnations of Panama City. One is Panamá La Vieja, site of the original 1519 city, now an Ozymandias-style assortment of ruins and stone walls. Towering over it is Central America’s only major metropolis – a Dubai-like curtain of steel-and-glass skyscrapers, home to the finance and service-oriented businesses that benefit from the canal and Balboa port, and the generous territorial tax system. Among them is the former Trump Ocean Club, a thinly disguised imitation of the Burj Al Arab and at 70 storeys the tallest mixed-use building in Latin America. When the Trump brand turned toxic, bookings at the hotel plummeted; it was rebranded as a Marriott earlier this year. Seeing this glitzy new Panama from the bulwarks of the old is breathtaking. Perhaps the best view, though, is from a marine viaduct opened in 2014 that loops around the city. Here super-sized SUVs speed commuters around the historic centre; Panamanians love to protest the American intrusion into their history, but they adore big cars, thick pizzas, Starbucks and baseball. The flight from Madrid to Panama City is the shortest to Central America, thanks to the weird contortions of the isthmus – where, at a certain longitude, the Caribbean is west of the Pacific. This fact, the canal, and the modern airport – and jet-friendly, mountain-free setting – have turned Tocumen International into Central America’s busiest airport. But many leisure travellers fly on, missing the renascent city – and its nearby attractions. The obvious pulls are the canal cruises, train rides across to Colón – on the old Gold Rush train – and birding and wildlife watching at world-class properties like the Canopy Lodges. I visited the one out at El Valle de Antón. Travelling on a Sunday evening, I was horrified at the traffic returning to Panama City (tip: never arrive there on Sunday evening in any mode of transport), but the road out was empty. After two-and-a-half hours, the minibus turned into a jungle-clad valley – in fact, a long-extinct volcanic crater. I spent two blissful days observing toucans, hummingbirds, tanagers, morpho butterflies, a cute sloth – scratching its bum for hours – and ornery ornithologists. Equally entrancing was a night spent on Taboga Island, 12 miles (19km) south of the Pacific entrance to the canal. Here Panama City’s facets playfully collide. I stayed at Villa Caprichosa, an Italian baroque-style boutique hotel owned by celebrated American designer Diane Burn. The rooms, the opulence, the private pool, the food were worthy of a Venetian palazzo. But the best thing was the view, from the private terrace – across the island’s pretty curving beach to a queue of container ships waiting for an “open sesame” from the canal authorities. In the distance, the new city, silver and gold in the afternoon sun. Panama City might well be Central America’s best stopover. For anyone tired of old towns or, indeed, countries where all talk is of a fabled past and perturbing future, it’s a heady, healthy, optimistic alternative. Like Havana, also founded in 1519, the legacy of American influence lingers. But aspirational capitalism drives Panama, along with global commerce – and the comfort of strangers. Along with its neighbour Colombia, Panama is responsible for the only break in the Pan-American Highway as it runs 19,000 miles (31,000km) south from America’s Arctic exclave Alaska to Ushuaia in Argentina. The cause of the interruption – 60 miles in length – is the notorious Darien Gap, an isthmus whose swampy terrain (and history as a nest of Colombian guerrilla activity) has made road building, to date, physically and politically impossible. Nonetheless, safety has improved hugely in the last five years – and intrepid travel operators such as steppestravel.com now offer hiking trips into an area known for its orchids. Panama is largely viewed as a Central American nation – while Colombia is part of South America. But these two were once one. Panama became a voluntary department of Colombia after achieving independence from Spain in 1821. It remained so until 1903 – when, with American encouragement (and naval help), it declared itself a sovereign state. The construction of the Panama Canal (again, with US involvement) began one year later. If general opinion considers Panama to be a flat, sea-level expanse, this reckons without the Cordillera de Talamanca, the phalanx of mountains it shares with its other neighbour, Costa Rica. Some of the range is protected as La Amistad International Park – a forested cross-border wonderland that was inducted into the Unesco World Heritage club in 1983. 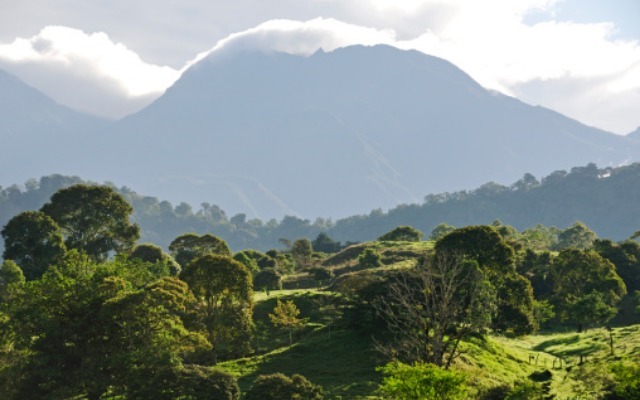 The Cordillera de Talamanca is also home to Volcan Baru, Panama’s highest point – a stratovolcano, 20 miles (32km) east of the border with Costa Rica, that hits an altitude of 11,401ft (3,475m). It is active, but has not erupted since 1550. It takes six hours to hike to the top. The origins of the word are vague, but legend has it that “Panama” was a village on the Pacific coast when the Spanish arrived in 1515. The translation? “An abundance of fish”. Esperanza Social Venture Club offers tours of Panama City from ex-gang members.